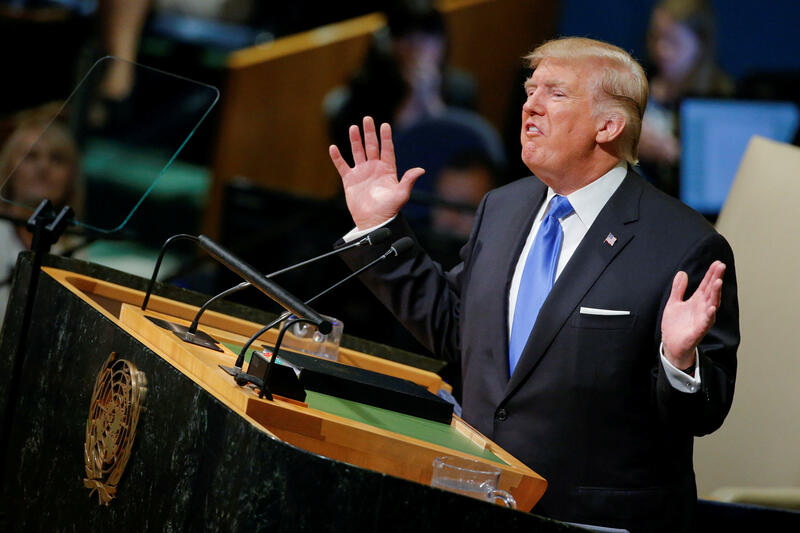 President Trump takes the stage at the United Nations General Assembly Tuesday after a year in which he heaped criticism on some of the United States' closest allies, while praising the leadership of his "friend" North Korean dictator Kim Jong Un and on Russian President Vladimir Putin. When Mr. Trump gave his memorable first speech at the U.N.G.A. last year, he appeared to mock "rocket man" Kim and threatened to "totally destroy" North Korea, if necessary. At the time, the president's stark comments made some fear the U.S. could be headed for nuclear war. And yet the backdrop of this year's speech is a much more conciliatory approach to North Korea. Mr. Trump has praised Kim's leadership of the country at such a young age, says they have a good relationship, and even called the dictator a "friend" in a radio interview that aired Monday morning with Geraldo Rivera. Mr. Trump said a "second summit" with Kim is in the works. Mr. Trump was frustrated when he received such negative reactions — even from his traditional allies — for his meeting and subsequent press conference with Putin in Helsinki, Finland, in July, in which he had appeared to believe Putin over his own intelligence agencies. The president was forced to clarify that he does believe Russia meddled in the 2016 election, and the administration has imposed sanctions on Russia, but Mr. Trump has at times still offered complimentary remarks about Putin and defended their meeting. Meanwhile, in recent months Mr. Trump has blasted Canada over its trade policies with the U.S. and declared the European Union one of the country's greatest foes over their trade practices with the U.S.
"Well, I think we have a lot of foes," Mr. Trump told "CBS Evening News" anchor Jeff Glor in a July interview. "I think the European Union is a foe, what they do to us in trade. Now, you wouldn't think of the European Union, but they're a foe." There remain some things that have changed little since last year's address. On Tuesday, Mr. Trump is expected to take a hard line against Iran, as he did in his 2017 address. Since then, Mr. Trump has pulled the U.S. out of the Iran nuclear deal. Secretary of State Mike Pompeo said Mr. Trump will have "strong words" for Iran's leadership this week. Also missing from last year's address by the president was any mention of the Israeli-Palestinian peace process — but diplomats in that region fear he could strike a harsh tone against Palestinian officials this year. The administration is frustrated with the Palestinians for not engaging in negotiations. Tensions between the U.S. and Palestinians have remained high since Mr. Trump moved the Israeli embassy to Jerusalem earlier this year from Tel Aviv and more recently cut funding for Palestinian refugees. State Department officials also believe, CBS News' Kylie Atwood reports, that Mr. Trump will bring up Venezuela in his speech to shame the regime led by Nicolas Maduro. The president spent Monday meeting with other world leaders, including French President Emmanuel Macron and South Korean President Moon Jae-In. Mr. Trump and Moon signed an updated free trade agreement. Mr. Trump is expected to speak at 10:15 a.m., following the president of Brazil.